Buh-bye, Color Resistant Gray Hair. You’ve been evicted. My hair today. Lightened ever so slightly. Highlights applied, but they didn’t take very well (stupid hair). The plan (since my hair isn’t going to magically start accepting color anytime soon) is to gradually lighten my hair (via color and highlights) until I am a medium brown (level 6 for you pros out there). I am currently dark brown (level 3) and while going so light makes me nervous, I have a better chance of hiding the gray with light hair and therefore can hopefully get away with color appointments spread 5-6 weeks apart. Otherwise, according to the very fabulous Toni, I’ll have to color my hair every 2-3 weeks. Um, in that case, lighter it is! I may have lost my Christmas cards, but at least my kids looked pretty darn cute. And really, appearances are all that matter. Kidding. I’d been lusting over the shirts at Twinkle Kids for some time, and when I saw the cookies and milk twin-set I had to email them and ask if they would let me buy them in different sizes. They did! Check out my little fellows on their website. Scroll down to the bottom of the page. I just want to gobble them up! OK. Shameless mom bragging moment over. I’m pretty sure my Christmas cards are trying to kill me. Three years ago I bought blank Christmas photo cards for Mikey’s first Christmas. I had every intention of sending our inaugural family picture to everyone unfortunate enough to cross my path during the last 32 years. I spent hours picking out the perfect coordinating outfits (wouldn’t want to look too matchy!) and scheduled our portrait appointment with glee. I even had the brilliant idea of including our two beagles, Buddy and Buster. These were going to be the best pictures ever! We arrived at the 8:00 am appointment on time and were positioned on a stage about 3 feet off the ground. The rest is a horrifying blur. Another family brought their mastiff for pictures and the beast wouldn’t stop barking. Buddy and Buster took that as open invitation to slobber, yelp, and fart uncontrollably. When that didn’t stop the barking, they attempted to crash through the make-shift walls separating them from Cujo. The Mr., in charge of reigning in the now-hysterical dogs, started to show cracks in his veneer. “Did you take the picture? Take the picture…now! No, wait. Now!” His face was slick with perspiration and his eyes wide and frenzied. I was losing him fast, but I had my own problems. Mikey was doing the slither maneuver to get off my lap, but since we were 3 feet off the ground I wasn’t giving him any wiggle room. I tried entertaining him by bouncing him on my knee, which worked out great until he figured out how to bounce himself. I could not get. him. to. stop. There we were: The Mr. sweating buckets, the dogs squirming and farting, Mikey bouncing, and me still trying to get my picture, damn it. Twenty minutes later I’m looking at the most horrifying family pictures I have ever seen. The Mr.’s smile looked more like bared teeth, Mikey was in mid-bounce, Buddy was looking up, Buster was looking left, and I looked like something living under a bridge. And that was the best of the bunch! Two days later I was at Sam’s Club with a picture of Mikey I took on the lawn ten minutes prior. 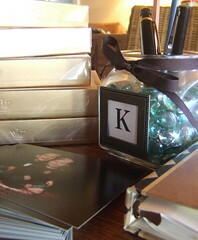 The next year we finally got decent family pictures, but I didn’t realize I had to use the studio’s photo cards. Foiled again! Last year I was 8 months pregnant and felt the picture would be missing something if The Mr. wasn’t holding a harpoon, so we opted for a picture of Mikey on a simple Shutterfly card. Yet again, the cards win. This year was supposed to be different. I found the cursed Christmas cards while cleaning out one of the closets and decided to schedule an appointment for our first family picture with Nico as part of the clan. I also purchased the most adorable shirts for Mikey and Nico and started writing rough drafts for the inside of the card. The day of the appointment came and the pictures actually came out well. They came in ahead of schedule so I picked them up and put them in a safe spot at home. On Friday I went to the closet to grab the box of cards and take them to the printer. Except they weren’t there. I opened the drawers. I pulled open the doors. I looked under the beds and in each of the closets. I searched the car and checked the studio in the backyard. In a final fit of desperation I started moving furniture. They. Were. Gone. See?! My cards are trying to kill me. Over the last four days, I checked every possible online and brick-and-mortar vendor in search of an alternative that didn’t leave us without money for Christmas. I finally found a reasonably priced set of photo cards at my local Hallmark. They are so lame. Not only are they completely ordinary, I already know people are going to think we are cheap bastards when they see our professional picture in a Hallmark photo card. The pictures cost 3 times what the cards did! I can hear them now, “Whoa. Check out the Kendalls. Couldn’t spring for the in-studio photo cards, eh?” Ouch. I know I’m going to find those cards. 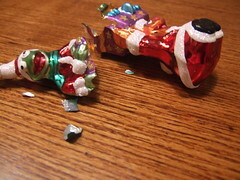 Most likely the day after I put the stupid Hallmark ones in the mail. These cards are evil like that. Well, I have news for them. The second I find them they’re going in the fireplace. And I’m wearing a crucifix and holding a bottle of Holy Water while I do it. Our Christmas tree isn�t the fanciest I have ever seen. I have seen trees that spin, play songs, and hang upside down. Our tree is crooked. It is too narrow. 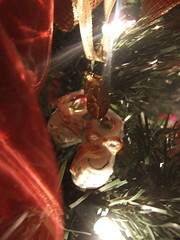 The boughs are sparse and cheaply made. 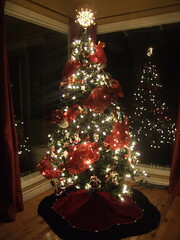 Our Christmas tree isn�t the prettiest I have ever seen. I have seen trees festooned with glorious, sparkling ornaments and lights that twinkle so perfectly that it all but takes your breath away. Our tree is quite empty. 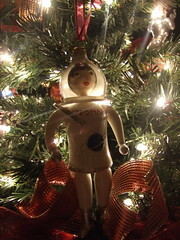 There are pockets of space in the front and the back has few, if any, ornaments. Our Christmas tree isn�t the tallest I have ever seen. I have seen trees so tall they seem a never-ending fountain of light, percolating dreams and wishes. Our tree is short. At just under 6 feet, I can just stretch high enough to put on the star. The star is too heavy for our cheap, little tree so it frequently topples over and I use physics to keep from toppling to the ground. No, our tree isn�t the fanciest, or prettiest, or tallest I have ever seen. Our tree is crooked, narrow, cheap, bare, and short. Our tree is a really bad blind date. Until you get to know him. 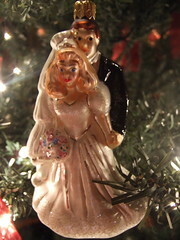 You see, something happens to our tree after the first couple of ornaments. He begins to speak and suddenly takes on a beautiful glow. He grabs me and tells me a story and after it is over, I can�t help but love him. I�m a sucker for a good tale, and he gets me every year. 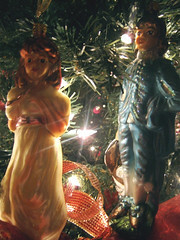 Our tree recounts the history of two people who, while dating, loved to visit museums. Their first date, in fact, was at LACMA. 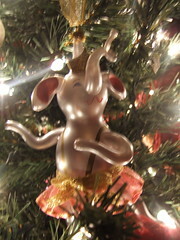 She is creative, flighty, and thinks elephants are brilliant. He is quiet, analytical, and a man of science. A couple of years go by, and they decide to get married. They celebrate their first Christmas. She is getting ready for law school and he is straightening his tie for work when the first plane crashes into the World Trade Center. Here the story stops, because that�s as far as they�ve gone. Don�t you want to hear more? I do. Each delicate, glass ornament captures a moment in our life. 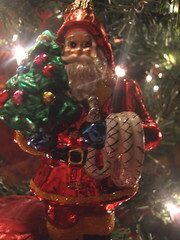 Not every moment is represented in our little tree but, hey, these ornaments don�t come cheap. We have time to add them as we can, so the Mr. reminds me. It�s funny. 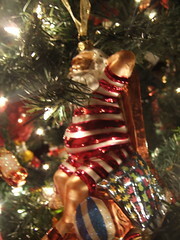 Of all the ornaments we own, only one did I purchase on a whim. 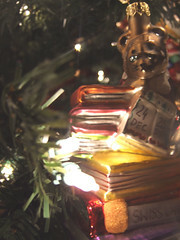 Every other ornament, including those we received as gifts, have a special memory behind it. 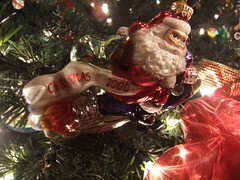 As Mikey handed me the ornaments, this �no memory� ornament slipped from his fingers and fell to the ground with a crash. The irony did not escape me. Or, at least it didn�t escape me an hour later after I had cooled down. It�s as if the little ornament couldn�t handle the guilt of it�s own insincerity. Our tree isn�t perfect and doesn�t look exactly how I wish it would, but that�s ok. I imagine one day it will be fancy, pretty, tall and perfect. When that happens we�ll know we lived a long and full life and our ornaments will soon find new homes sprinkled among the crooked, narrow, cheap, bare, and short trees of our children, grandchildren, and great grandchildren. Provided we don�t drop any more. *Each Friday I try to post an essay and picture of my favorite moment of the week. If the week sucked beyond all comprehension, I might post my favorite “worst moment” of the week. Someway, somehow, you’re getting my favorite moment. Sometimes life is very busy and you get overwhelmed. Adults know this, and deal with the chaos accordingly. Friends, I�m a whiny, little 3-year old. In the last two weeks, I have attended two baby showers (one of which I hosted), one rehearsal dinner, one wedding, one post-wedding brunch, two birthday parties, 6 doctor appointments for the boys, and hosted Thanksgiving. I also had a birthday, but it sucked so magnificently that it doesn�t even warrant an honorable mention on my �Holy Crap, I�ve Been Busy!� list. In between all of this I worked on Paper Souffl� and wrote a few pieces for clients. So, yeah, I�ve been feeling over scheduled, unappreciated, and really, really bitchy. Did I mention I�m a whiny, little 3-year old? Well, recently an act of kindness from across the country restored my faith in humanity. When I became pregnant with Nico both my best friend and my sister-in-law were struggling to get pregnant. I felt guilty talking about anything pregnancy related and, understandably, I doubted they wanted to hear me complain about my morning sickness. So, I went and did something crazy: I joined an online group for pregnant women due in February 2007. We were a large group of 50+ women who quickly bonded over cravings, mood swings, and all things baby. Fast-forward 18 months later and only a tight knit group of 10 remain. 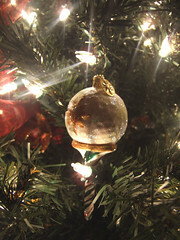 Since the babies will soon celebrate their first Christmas, we decided to do a small ornament exchange. I received my package on Monday from the lovely Colleen, and I am touched beyond words. Not only did she include a glass ornament for Nico knowing that I collect glass ornaments, she also remembered that big brother Mikey is obsessed with Mickey Mouse. What do you think I found, carefully wrapped up and sitting snuggly next to Nico�s ornament? That�s right. 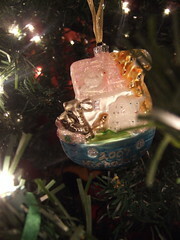 Nothing less than a Micky Mouse ornament, personalized by Colleen herself for Mickey�s biggest fan. The fact that someone whom I have never met in person remembered that my oldest loves Mickey Mouse and was generous enough to include him in the ornament exchange was so very kind. And what did Mikey think of his very own Mickey Mouse ornament? I think I can comfortably say he was over the moon with excitement.